No film festivals in the Bay Area this week. But there are a few films I can tell you about (and I do mean a few). A The Night of the Hunter, Castro, Thursday. Widow and mother Shelley Winters makes a very bad choice for a second husband–a cruel, sanctimonious, violent, and criminally insane preacher (or fake preacher) played by Robert Mitchum. Told mostly through the eyes of the two children who must survive their new stepfather, the story is grim, atmospheric, frightening, and haunting. Then, in the last act, Lillian Gish shows up as a practical, down-to-earth savior of lost children. It’s some sort of Christian parallel, although I’m not exactly sure how. Charles Laughton’s only film as a director, it makes you wish he made more. B Shanghai Express, Stanford, Wednesday through next Friday. "It took more than one man to change my name to Shanghai Lily," Marlene Dietrich explains in Josef von Sternberg’s exotic pre-code adventure. The story follows multiple Europeans stuck in the political turmoil of a China that could only exist on a Hollywood soundstage. The result comes perilously close to dull melodrama, but it’s raised almost to a fine art by glorious camerawork and art direction, some clever dialog, and entertaining performances by Dietrich and Anna May Wong. On a double bill with another Sternberg/Dietrich collaboration, Morocco. Double bill: To Be or Not to Be (1942 version) & Unfaithfully Yours (1948 version), Stanford, Saturday through Tuesday. I haven’t seen either of these ’40s comedies recently enough to grade them, but I remember them fondly. 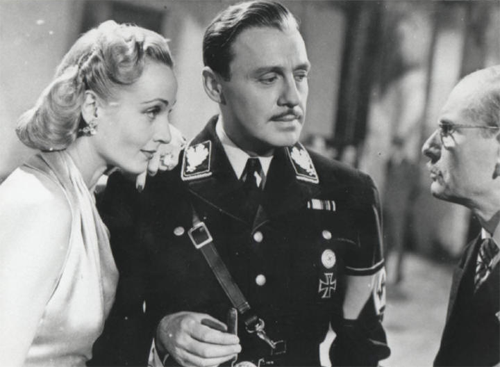 In Ernst Lubitsch’s To Be or Not to Be, a Polish theatrical troupe–led by Jack Benny and Carol Lombard–uses their acting skills to confound and confuse the Nazi occupiers. In Preston Sturges’ last good movie, Unfaithfully Yours, Rex Harrison plays a symphony conductor who suspects his wife of infidelity. His daydreams of revenge and punishment work perfectly in his mind–always to the tune of whatever music he’s conducting. But in real life they backfire in some of the funniest possible ways. Curiously, both films were remade in 1983/84. 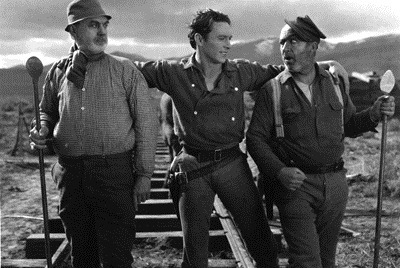 B The Iron Horse, Niles Essanay Silent Film Museum, Sunday, 4:00. John Ford’s first big-budget movie and first huge blockbuster hit plays as a trite but entertaining melodrama. The characters are simplistic pawns and stereotypes, and the patriotism is overblown, with an almost God-like view of Abraham Lincoln. But the spectacular visuals and exciting action sequences, especially the final Indian attack (yes, it’s also racist, but that’s hardly unusual for an American film of the 1920s), have an impact beyond the story and characters. They bring the mythic West alive—just as one would expect in a John Ford western. Part of Laborfest, with Bruce Loeb accompanying on piano. C+ Cleopatra, Castro, Sunday. New digital restoration. At 243 minutes, this widescreen epic clocks in as the longest single theatrical release by a major American studio. And at an estimated 40 million 1963 dollars, it’s probably the most expensive. It’s also very dependent on a large screen and a large format to work (it was shot in Todd-AO and originally screened in 70mm). 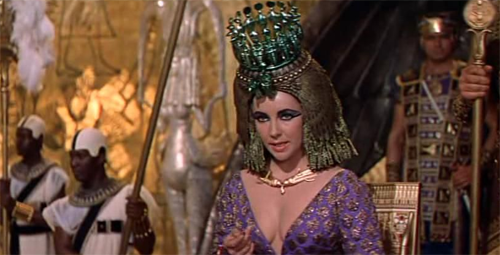 In most theaters and with most projectors, the first half (Rex Harrison as Julius Caesar) is mildly entertaining, and the second half (Richard Burton as Mark Antony), unbearably boring. But with the Castro’s large screen and a good enough print (or in this case, DCP), the movie’s spectacle makes it much more fun. The first half becomes spectacular entertainment and the second…well, not quite as boring.